Entry to the festival is free. Please be seated by 2.45 pm. Susant Mishra's Indradhanura Chhai (Shadows of the Rainbow ) shows how urbanization and the consequent rise of modern consumerism have affected the traditional social and family structures in Bhubaneswar. Against the backdrop of this changing cityscape, Indradhanura Chhai explores the multidimensional conflicts of its characters, their changing perceptions about human nature and personal relationships. With hypnotic visual rhythms, Susant Mishra shows the lives of three women living in the modernizing town of Bhubaneswar, its skyline dominated by magnificent temple architecture. Bakul Foundation is a movement to pool together the small individual efforts of all the people interested in the social development of Orissa. As the first major initiative, we have started a movement to get a thousand of us (to begin with) to contribute in small ways to set up excellent children's libraries and creative learning centres in Bhubaneswar by April 1, 2007.
mentioning your name, contact number/email. I have received a poster for the same from Sanket Nayak and sent it to admin for publishing here. 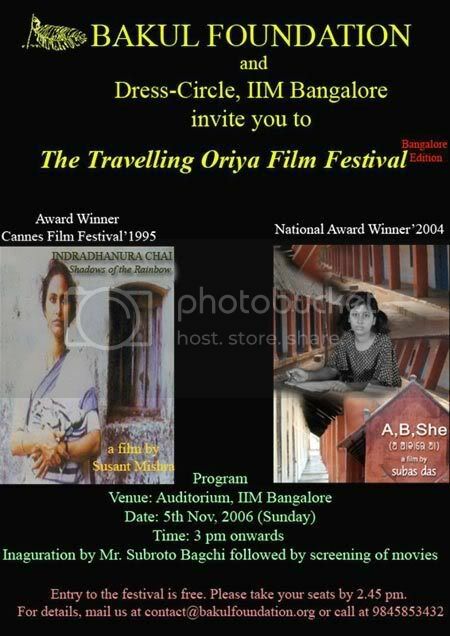 Here is the original poster for the Travelling Oriya Film Festival, IIM Bangalore. Just called them up and got confirmed about the program. Dont worry about the shortage of seats. They need our participation in large numbers and believe that no such problems will arise. You are assured of a seat for the festival. Just come in large numbers. Information obtained from Mrutyunjay, one of the organisers, over the phone number provided. It is awesome to see all people are seeing it in great passion. Thank you all . I will try to give some other events if they happen in my knowledge . Its good to see a such a good response for the oriya film festival. I am part of the organizing team and do let me know in case any other details are required. It would be great if we can also get our non oriya friends to come and see oriya movies (it will have english subtiltes). You could have told it earlier! All my friends in Bangalore are going to enjoy though! Clarification from bakul Foundation on Oriya Film Festival. Sujit Mahapatra (Bakul Foundation) has provided the detailed information regarding the Bakul Foundation and this Oriya film festival. There are no tickets. The screening is free as the foundation want to promote the best of art from Orissa. instrumental in getting the support of IIMB to host the festival. promotion of the arts and culture of Orissa outside the state. Secondly and more importantly, it needs to bring into light the initiative for its library movement in Orissa and seek to mobilize support for it through this festival. Request to all Oriyas in Bangalore to come with friends and family to witness this grand event. The name of this topic has been changed accordingly. "Live your life in your own terms"
Dont worry...we are planning similar things in many major cities and institutions and hopefully you will get to participate in one of them. I will post the link of the photos and videos in this forum. I would like to Thank all the members of bakul foundation for their sincere effort to promote our films outside the state.